Plagued by fear and disillusionment, Callie Hayes volunteers for a psychology experiment that promises to turn her life around. Unnerved by the mounting evasiveness of the research workers, however, she soon changes her mind and asks to be released from the project. To her horror, the workers refuse, dropping her instead into a terrifying alien world amidst an ongoing battle between good and evil. With limited resources and only a few cryptic words to guide her, she embarks on a journey that will change her life forever. 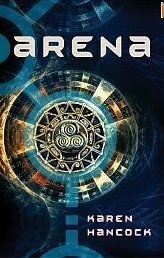 Will she decipher the plans the Benefactor has established for her escape, or will she succumb to the deception of the Arena? A 2003 Christy Award Winner! Recently repackaged and available in hardcopy. Also available as an ebook. Buy it NOW.